A confidant VisitBritain came to London’s Wembley Stadium for this year’s Hosted Buyers Mart. Confidence comes naturally to a marketing organization whose destination set records in both overall visitation and spending in 2013. Spending was up 13 percent to a record £21 billion and arrivals reached 32.9 million, up 6 percent, the best since 2007. VisitBritain needed a good 2013 to silence a chorus of critics of the 2012 London Olympics, who largely thought the games just upset the apple cart, taking London out of the normal rhythms of the travel calendar. The numbers also provide the evidence the agency needs in its appeal to the British government to allot more capital in its budget. Dawe sees the visitor growth as a direct consequence of the improvement in Britain’s image thanks to the Olympics. She cites the National Brand Index, which ranked Great Britain third overall, and which saw some post-Olympic improvement in the British image as it rose two rankings in how people rated its natural beauty and rose three tiers in how people viewed the welcome they’d receive there. The U.K. needs a better spread of visitors throughout its kingdoms and also throughout England itself if it’s ever really to full tap all of its destination resources. That’s especially true for the U.S. market, which generally features a 60 percent repeat rate. That makes it essential to get Americans out to such beyond London destinations as Canterbury, Chester, Liverpool, Manchester, York, the Lakes District and Cornwall, to name just a few English places, not counting Wales, Northern Ireland or Scotland. New fresh product and unknown destinations can give the U.K. what it needs to get the U.S. back to its best performance. The market performed best in 2000, when 4.1 million Americans braved the perils of Y2K and visited Great Britain. There are only a handful of destinations in the world that feature so many places with such deeply vertical cultural histories as the U.K. and those places are spread thickly throughout all four countries. Traditionally, the track beaten by U.S. visitors runs almost exclusively through London with a few very popular add-ons. “People think they’ve seen the U.K. because they’ve been to London, but there’s a lot more to Britain than they imagine.” London Plus has become a mantra in the trade: London plus Kent, London plus the Cotswolds or London, York, Edinburgh and so on. Getting beyond London keeps the product fresh for what almost every player in British tourism calls the most important market, the U.S. Though the U.S. led all market in spending in 2013, it only grew at a 1 percent rate in arrivals with 3,560,000 visitors. The Olympics may have planted the seeds for a future escalation of arrivals, by forcing those who did go the U.K. in 2012, not as Olympics visitors, to avoid what they thought would be an overcrowded and overpriced city and explore more widely throughout the U.K. and England itself. In 2013 as the year showed a far greater spread of tourists who visited throughout the country and not just in London. The remarkable success of Downton Abbey has really helped push many tourists beyond London as journeys to the Cotswolds’ locations of the series have become extremely popular. 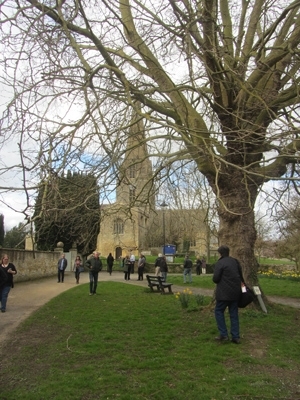 The town of Bampton, where much of the series is shot, is situated in the most classic sort of Cotswolds’ landscape only two hours from London. 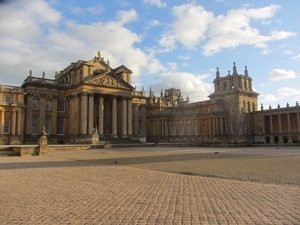 The show has also helped generate business to Blenheim Palace and other stately homes. London has also added some fresh product. The $18 billion in Olympic investment added everything from a new East London Metro Line to the redevelopment of Kings Cross St. Pancras Station. South Park will open in the former Olympic Park this April. Of London’s 120,000 hotel beds, some 30,000 were added for the Games. The coming years look bright for VisitBritain and the schedule is full. The Ryder Cup will be coming to Gleneagles in Scotland; the Homecoming will call home the Scottish diaspora and Wales will hail the centenary of the birth of Dylan Thomas as England commemorates the 450th anniversary of William Shakespeare. VisitBritain will emphasize more of the countryside in the 2014 GREAT Campaign, with national parks being highlighted. Over the longer haul, VisitBritain hopes to reach £31.5 billion in spending and 40 million visitors by 2020.